Tuesday, February 6, 1912: Am trying to get ready for monthly exams. They come tomorrow and the day after. I have sad hopes and misgivings for one study especially. I’ve recently posted many of Grandma’s diary recent entries which indicated that she was working very hard on her algebra. And, I’ve provided a lot of background information about algebra a hundred years ago. When I got ready to write this post, I wondered what else I might write about algebra. To get inspiration, I flipped through a 1912 algebra textbook —and I happened to notice that one of the problems in the book was about the average height of males and females.—and it included a data table with heights for selected ages between 3 and 21. This reminded me that I’ve heard that on average people are taller now than they were a hundred years ago—and the next thing I knew I was headed off on a tangent. Click on graph to enlarge. I found recent Centers for Disease Control data on average heights in the US. Since 2012 data are not yet available, I assumed that it is the same as it was in recent years. I also assumed that the data in the algebra book was correct for 1912. On average, three-year-old children are much taller now than they were 100 years ago. Three-year-old boys are almost 4 inches taller; girls about 3 and 1/2 inches. 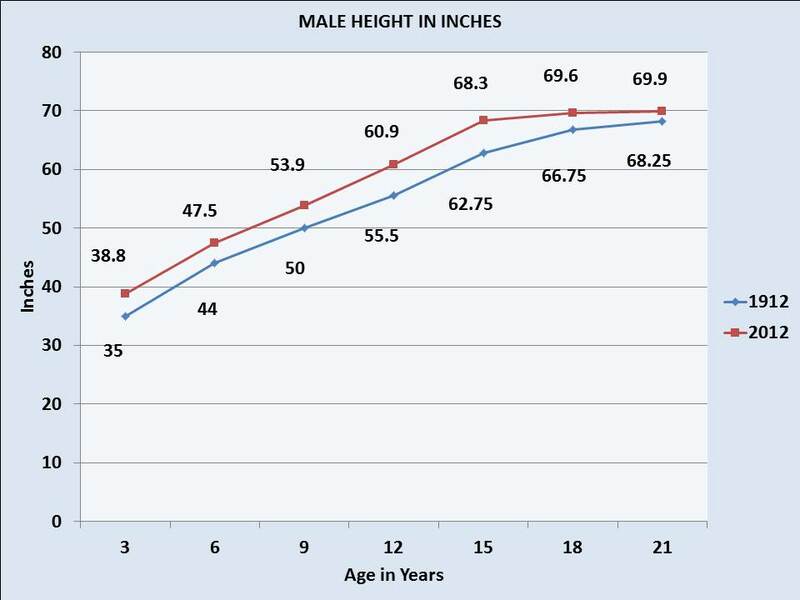 By age, 21, males now are, on average, more than 1 1/2 inches taller than they were a hundred years ago. In 1912 the average 21-year-old male was 68.25 inches (5 feet 8.25 inches) tall. Now the average male in the US is 69.9 inches (5 feet 9.9 inches) tall. Females are about 1/2 inch taller now than they were a hundred years ago. In 1912 the average 21-year-old female was 63 .75 inches (5 feet, 3.75 inches) tall. 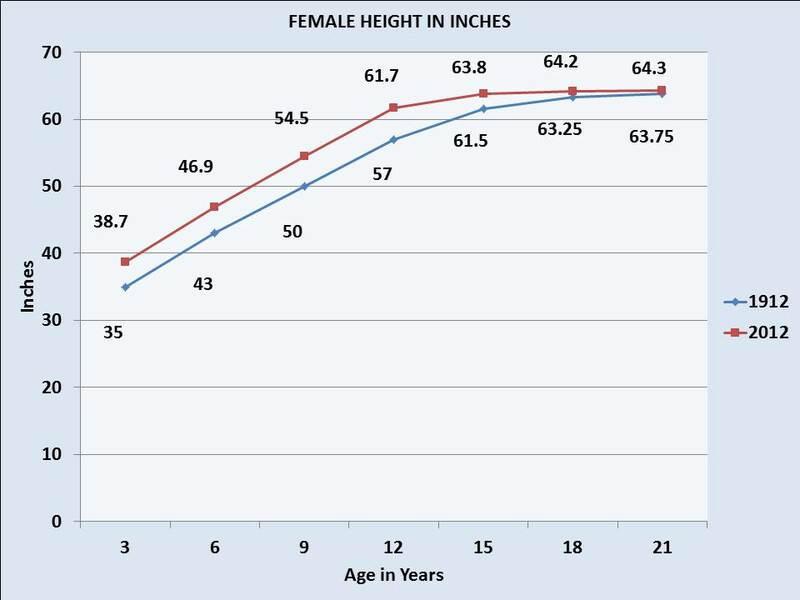 Now the average 21-year-old female in the US is 64.3 inches (5 feet 4.3 inches) tall.